Top quality, tapered cutting comb with good flexibility making it ideal for barbering and all scissor-over-comb work. 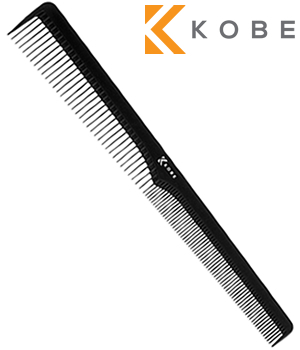 This superb Kobe Carbon Comb is also available as part of a set of 6 carbon combs at a money-saving discount to the price of buying all 6 separately and supplied with a free comb wallet! £2.34 (inc. VAT) Why no VAT? We're a trade wholesaler and quote our prices without VAT to help our VAT-registered customers understand the true cost of a purchase.